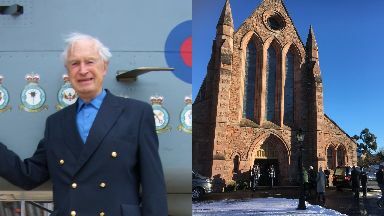 Captain Donald Macintosh was laid to rest on Wednesday at Crieff Parish Church. Tributes: Captain Macintosh visiting his old squadron and, right, funeral at Crieff Parish Church. 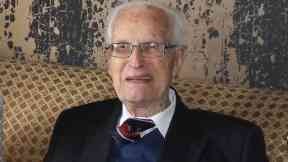 Tributes have been paid to an "extraordinary" WW2 pilot, responsible for bombing Hitler's home, after he died aged 96. Captain Donald Macintosh, also known as Mac, was laid to rest during a funeral service at Crieff Parish Church on Wednesday. The widowed father-of-five and grandfather died peacefully at his Perthshire home on January 10, while being cared for by his daughter, Allyson. Mac, from Clydebank, joined the RAF in 1941, aged 19, and trained on Tiger Moth and Stearman biplanes in the UK and Florida. Success: Mac and his crew. 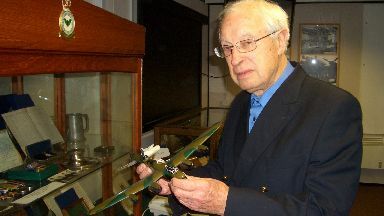 He was then posted to the Operational Training Unit at Silverstone to learn to fly the twin-engined Wellington bomber. Mac was recognised for his talents after he skilfully landed a Wellington with empty fuel tanks. His crew, under his exceptional leadership, went from strength to strength and were soon formation leaders, pathfinder leaders and windfinder leaders. Mac's crew were involved in all three raids on the German battleship Tirpitz, including the attack that sunk the vessel in November 1944. 2007: Mac at the Squadron reunion. Other missions included sinking a destroyer in Gdynia Harbour as well as raids on three dams, two oil refineries, four viaducts, three bridges, three submarine pens, one ammo dump, two flying bomb sites and two cities. Mac also flew in one of Bomber Command last operations of the war, a raid on Adolf Hitler's holiday home in Berchtesgaden - better known as the Eagle's Nest - on April 2, 1945. Mac completed more than 40 operational missions and was commissioned and awarded the DFC. At the end of the Second World War, Mac got himself onto a RAF Transport Command Conversion Course by bribing a WRAF Corporal with some stockings. Having converted to transport aircraft, he left the RAF and joined BOAC, then British Airways. He was a Captain on Comet 1s, Boeing 707s then Boeing 747s for more than 30 years. Mac was awarded the Chevalier de l'Ordre National de la Légion d'Honneur in 2015 for his help to the French civilians during the war. Donald's daughter, Allyson Macintosh, spoke at the funeral saying: "He was an extraordinary human being. "He was proud Scot and was proud to serve his country. He was a father of five and a keen member of the community. "He always lived life to the full and carried his dry Scottish humour to the end. "My dad was a loving and decent man who cared for us all to the very end." "He was my hero and best friend and is leaving behind a legacy larger than most. May God rest his gentle soul." Group Captain A.C. Montgomery OBE, MA RAF, said: " I only wish Donald was there to read his own words. 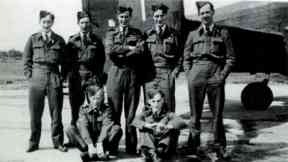 "He was an honour to his country and to the RAF. It was a privilege to meet him." Squadron leader Richard James said: "It is almost 75 years to the day that Donald came to Silverstone and it was there he picked his aircraft crew." When Richard talked about an incident where Mac and his crew flew a Wellington aircraft with its two wing fuel covers undone he said: "Most would've crashed but not Mac. "They had an exceptional pilot and an above average crew for sure." Richard also talked about Mac's aircraft handling when the enemy approached, saying: "Mac would throw the plane into a corkscrew to get away. "This is a move that's still used with the RAF today."